Lock in a great price for Hampton Inn Emerson - Lakepoint, Ga – rated 9 by recent guests! Good location off I 75 and good breakfast with good variety. Very friendly staff and nice long pool. The lady at check in was amazing!! Hotel was very clean and will definitely be coming back. The rooms was very quiet and clean,we came from mississippi to visit our family and we enjoyed everything about this hotel,the breakfast was great and the staff members were very nice and helpful.I will stay at this hotel again. Everything else. Staff was great! Room was clean, breakfast was good. Great location for restaurant surrounding the hotel. Yes, I would stay again but would request room on other side of the hotel. It was perfect location to LP sports complex, as well as family friendly places. Breakfast was the best, liked the shampoo ,conditioner, mouth wash, and body lotion and soap stayed two nights and had to ask for more for second day. Super convenient for attending sports venues at Lakepoint. Room was big. Great bathroom, safe for older people because of the large walk in shower. Spacious room with comfortable seating and bed. Hampton Inn Emerson - Lakepoint, Ga This rating is a reflection of how the property compares to the industry standard when it comes to price, facilities and services available. It's based on a self-evaluation by the property. Use this rating to help choose your stay! Just a short walk away from the sports fields, restaurants and shopping that make up the sporting community, this hotel is located in the heart of LakePoint, GA and features a heated indoor pool, on-site sporting facilities and an outdoor patio. 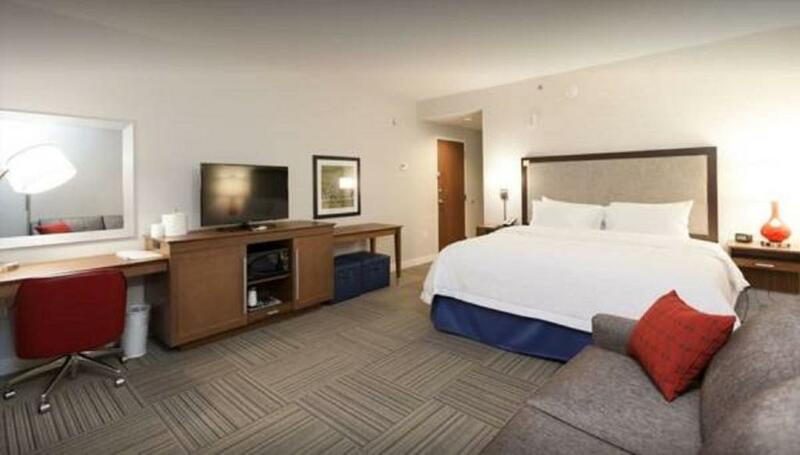 Every room at Hampton Inn Emerson – Lakepoint, Ga provides a 42-inch flat-screen LCD HDTV with premium cable and movie channels, along with a microwave and small refrigerator. Select rooms also offer a sofa bed and extra vanity. Complimentary hot breakfast is served daily at the hotel. For guest convenience, grab-n-go breakfast bags are also available. Guests can enjoy an array of on-site sporting activities, including baseball, basketball, tennis, volleyball, wake boarding and much more. The hotel also offers a fitness center with modern cardio equipment and an outdoor patio with fire pits and views of Lake Allatoona. LakePoint Champions Center and LakePoint Park are both a 2-minute drive away from the hotel. Red Top Mountain State Park is 4 miles away. This property also has one of the top-rated locations in Cartersville! Guests are happier about it compared to other properties in the area. This property is also rated for the best value in Cartersville! Guests are getting more for their money when compared to other properties in this city. When would you like to stay at Hampton Inn Emerson - Lakepoint, Ga? This suite features a seating area with a sofa, a mini-bar and a large bathroom with a vanity. This room includes a work desk with an ergonomic chair and a private bathroom with a hairdryer. This suite offers hearing-accessible amenities, including a visual alarm system and notification devices for the doorbell, door knock and incoming telephone calls. House Rules Hampton Inn Emerson - Lakepoint, Ga takes special requests – add in the next step! Hampton Inn Emerson - Lakepoint, Ga accepts these cards and reserves the right to temporarily hold an amount prior to arrival. The staff are amazing! Rooms are nice size and very comfortable! Great breakfast and fab coffee! Bed was soft so I had a sore back but otherwise the rooms are good, very big. Everything. Clean, comfortable, food was really good. View from my room. Top of portico. Bed was too soft. Train tracks across the highway from hotel. I loved everything about the place. Maybe bacon on the breakfast menu. Beds were firm. Not horrible.... just not what we're used to and woke with a sore back. Great location. Front desk staff were amazing. Clean. Decent breakfast included. Nice n clean! Staff were friendly! Breakfast, although it had a good enough spread, nothing tasted fresh. . Nearby train schedule. Bathroom door did not close properly. Nice large queen suite. Clean. Location.